Green coffee beans are the natural forum of untoasted coffee beans that contribute to weight loss and the maintenance of a healthy weight. Green coffee beans contain Chlorogenic acid, which is considered one of the main components found in natural green coffee beans, since after toasting the coffee beans the rate of chlorogenic acid drops significantly. Chlorogenic acid is considered a powerful anti- oxidant, which combats free radical and assists process of weight loss and metabolic acceleration. In addition, chlorogenic acid allows improved fat burning and a reduction in the excess of sugar that stored in the tissues and turned into fat. Green coffee beans contain a certain level of caffeine, which also contributes to better fat burning with or without physical activity and contributes to the increase of energy and vitality. The green coffee beans in each capsule supply 100 mg of green coffee extract. Maintenance of a healthy weight and shapely figure. An ingredient with diverse medicinal qualities. Recommended dose: One capsule a day with a meal. 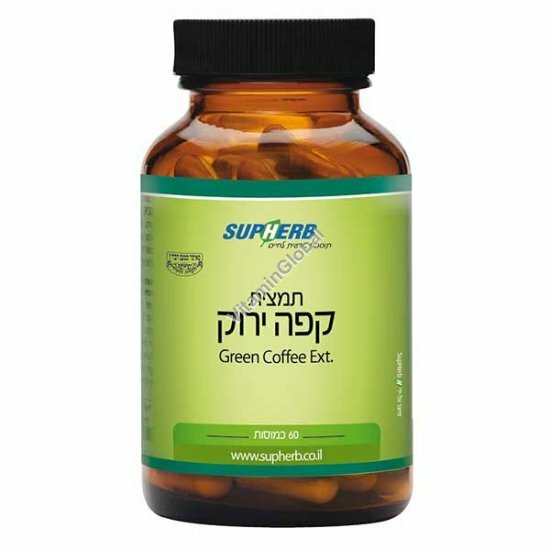 Green Coffee Extract is available in packages of 60 capsules.